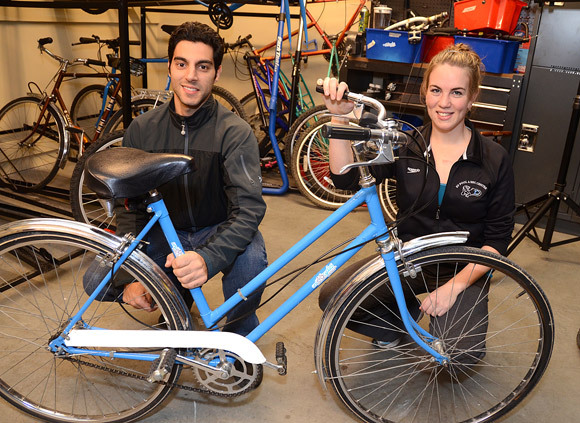 Meshkat Javid and Jane Hollenberg are looking for bike donations for the UBCycles program. The program allows students, staff and faculty at the University of British Columbia’s Okanagan campus to borrow a bike for a few days or an entire term, but donated bikes are needed. It’s UBCycles to the rescue. UBCycles, formerly known as UniCycles, is a program whereby staff, faculty and students at the University of British Columbia's Okanagan campus can sign out a bike for a few days to a full term. Meshkat Javid and Jane Hollenberg took over the program that started last year and are already adding features to the loan program. Hollenberg says people can still sign out bikes, but they are also adding bike-maintenance clinics, offering secure storage for commuters as well as a place to repair their bikes. “We wanted to add to the program to get more people involved,” says Javid. One of UBCycle’s goals is to get more people out of their cars and using pedal power for commuting to campus, but more bikes are needed to fill the anticipated demand. “All of the available bikes will be by donation,” says Javid, adding that donated bikes will be put in good running order before loaning them out. Those wanting a bike must provide basic information before they can ride away fully kitted with a bike, helmet, light, small repair kit, tire pump and a lock. While the program will loan out adult bikes, Javid says they are also currently looking for donations of children’s bikes for a spring event planned for March. “The kid’s bikes will be fixed up and used in the event. Then we’re hoping to donate them to a kid’s charity along with money we raise from the event,” says Javid. UBCycles is working with local bike dealers Chainline Cycles, Union Cycle and Cyclepath. If you are interested in donating a bike, or for more information on the program, email ubcycles.okanagan@ubc.ca.